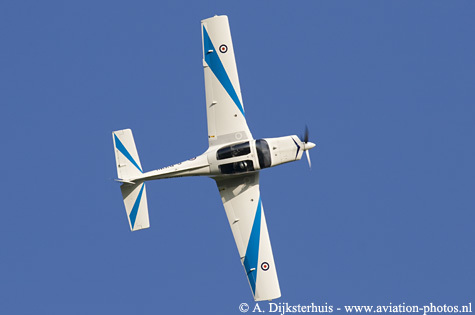 The open days were this time held at Leeuwarden Air Base on Friday 15 and Saturday 16 September. The weather was good on the Friday and combined with some interesting participants and displays, this resulted in good opportunities for decent photographs. The images on this page are made on Thursday 14 (arrivals and rehearsal day) and Friday 15 September. 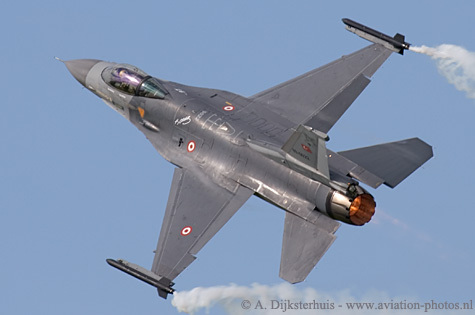 The Turkish Air Force (Türk Hava Kuvvetleri) celebrated the centennial in 2011 with the creation of a F-16 demonstration team called 'Solo Turk'. 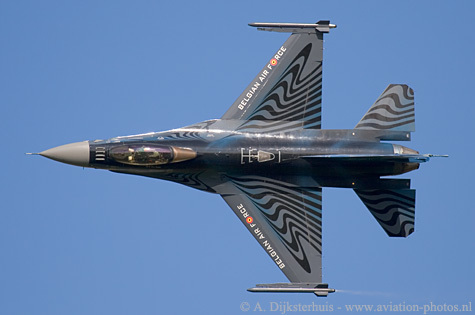 A special livery was applied to F-16C with serial 91-0011. 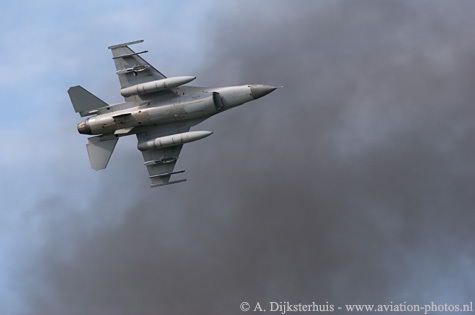 This particular F-16 was scheduled for a photo shoot, together with the Dutch and the Belgian demo F-16s above the isle of Texel and therefore the spare F-16C with serial 89-0022, was used for the rehearsal on Thursday. The special painted F-16C flew the demo on the Saturday with some cloudy weather. 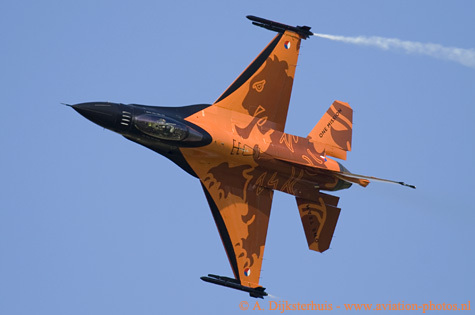 As mentioned, the Belgians were present with their F-16 Demonstration team and flew a splendid display. Their rehearsal on Thursday was also flown with their spare. 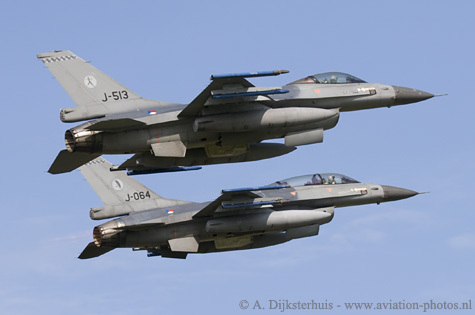 It takes three to tango, but the F-16 Demonstration Team of the Royal Netherlands Air Force can not be missed on their own open days! F-16AM with serial J-015 is seen while making a nice pass in front of the crowd on Friday. 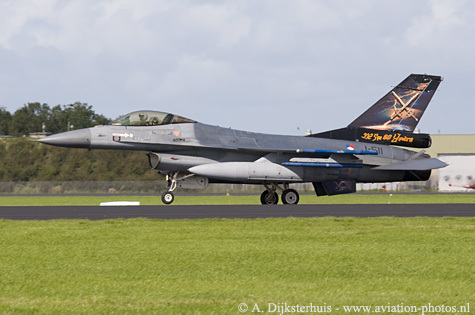 F-16AM with serial J-511 is seen here with a special tail, celebrating the 60th anniversary of 312 Squadron in 2011. 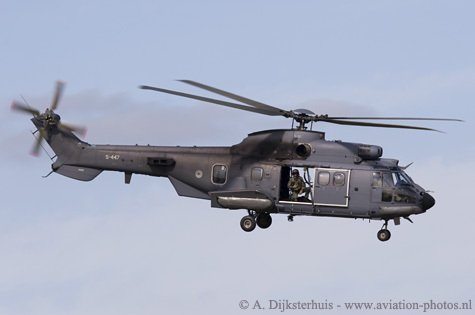 It is seen here arriving at Leeuwarden Air Base. 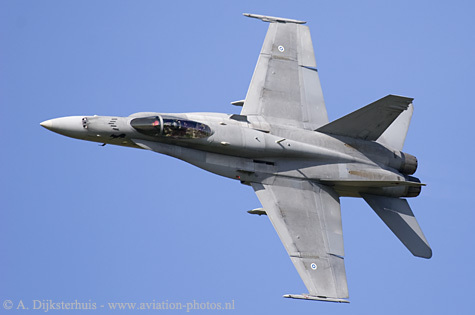 The Finnish Air Force participated with their F-18 Solo Display. F-18C, HN-405 is depicted here during one of the nice passes. The Solo Display also used flares, which can be seen at the top of this page. 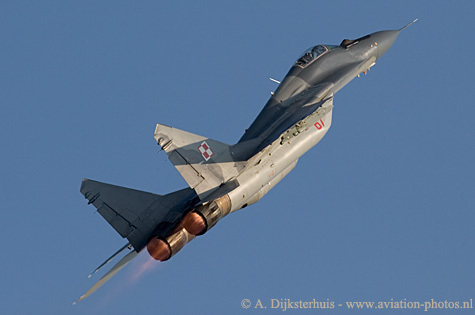 The Polish Air Force could not fly the rehearsal on Thursday with their Mig-29A. This resulted in a rehearsal on Friday morning at around 08:45 with Mig-29A, serial 67. This, prior to the official start of the displays! Leeuwarden became a real Hunter base with five (!) flying Hunters and another Hunter on static display. Tight formations as depicted here combined were combined with nice passes. 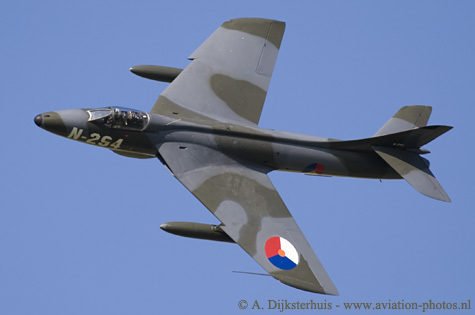 The Hunter F.6A marked as N-254 is based at Leeuwarden Air Base and belongs to the Dutch Hawker Hunter Foundation and is registrated as G-KAXF. The Italian Air Force was present with the Typhoon display and this MB.339CD with serial MM55068/RS-33 which is operated by the Reparto Sperimentale Volo (RSV). 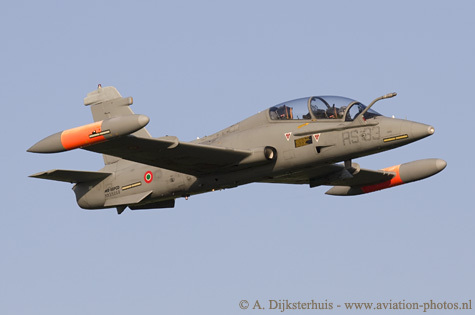 The RSV is the test unit within the Italian Air Force and based at Pratica di mare, Italy, near Rome. 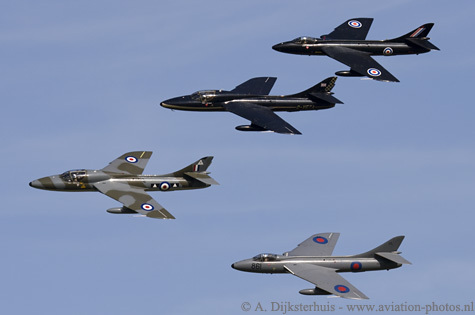 The Royal Air Force Hawk display is seen here during it's display. 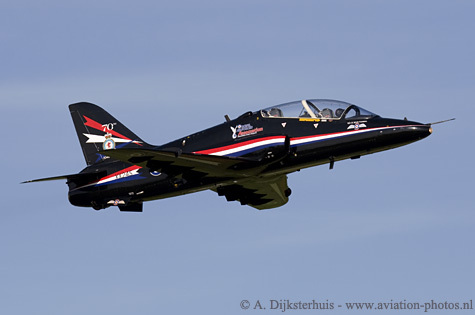 This Hawk is based at RAF Valley and operated by 208(R) Squadron. Special markings celebrating the 70th anniversary of the unit are applied on the tail. Some nice displays were made with a Tutor T.1 and a PC-7. The Tutor T.1 is operated on behalf of the Royal Air Force, but civil registrated as G-BWYL. The Austrian Air Force is fortunately one of the air forces that applied a real military livery on their trainers. 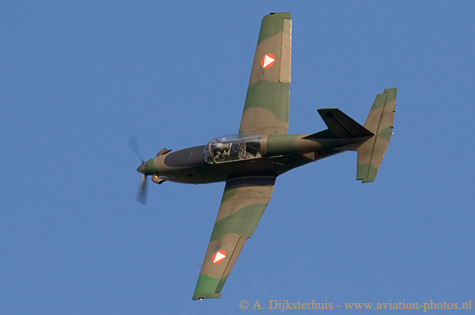 Pilatus PC-7, the 3H-FA, is based at Zeltweg. Flares! Flares! Flares! 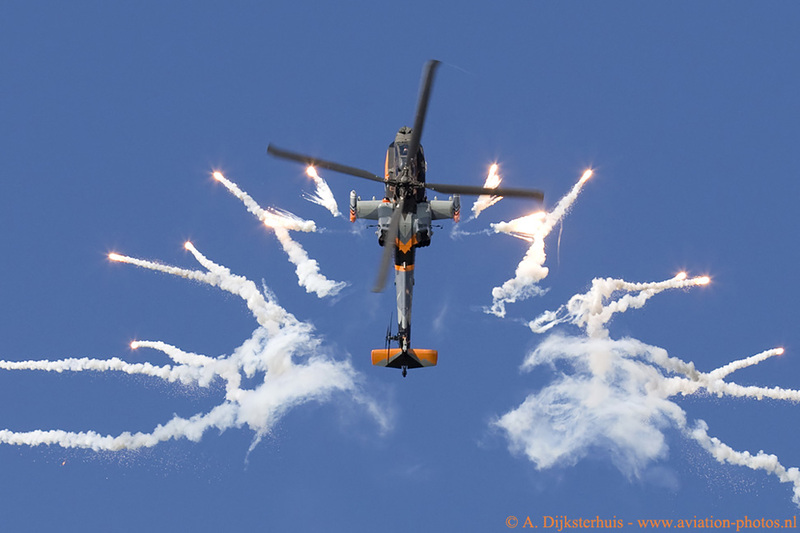 The AH-64D Apache Demonstration team from the Royal Netherlands Air Force was one of the highlights during the Open Days. Flares were used several times during their display. 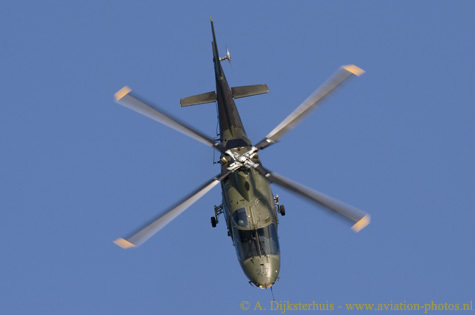 The Belgian Air Component was present with not one, but two helicopter displays! 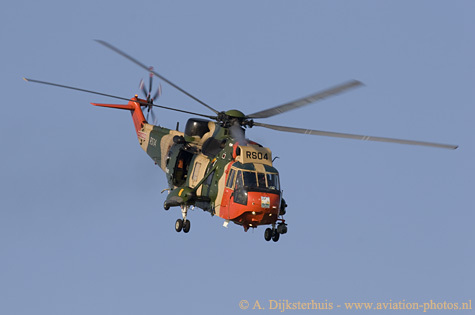 A.109BA with serial H27 from Beauvechain and this Sea king Mk48 (RS-04) from Koksijde Air Base were nicely displayed by their crew. The Air power Demo became a tradition through the years. A large demonstration is made in front of the crowd, to demonstrate operations like capturing an airfield in hostile territory. F-16's supported by a KDC-10, Apaches, Cougar, Chinook transport helicopters and a Hercules operate together in a simulated situation. Two of the F-16s; F-16AM with serial and F-16BM J-064 are seen her in take-off. Pyrotechnics are used to give some special effects with the explosions and dark smoke which creates a good theatre for the photographs. 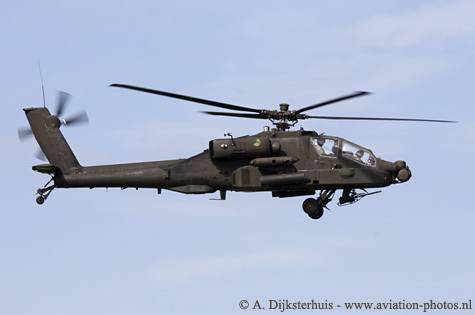 The Q-13, AH-64D Apache seen here below on the left. AS.532U2 Cougar with serial S-447 is seen here departing after the delivery of the troops.